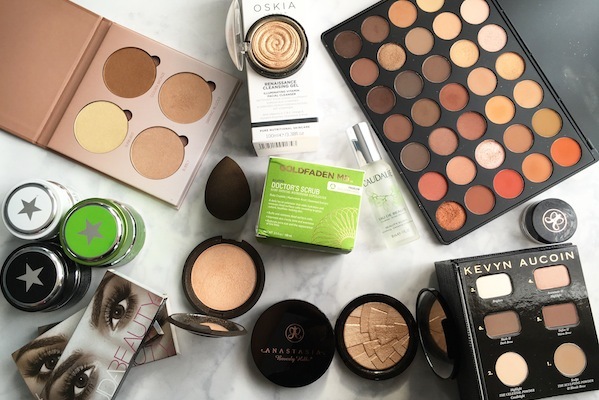 CultBeauty are an online beauty store that sells products from hard-to-get brands such as Hudabeauty, Morphe and Anastasia Beverly Hills. Below are my favourites. 'Swoon-inducingly beautiful, Anastasia Beverly Hills' Glow Kits each contain four, velvety-textured highlighting powders to enhance your cheekbones, brow bones, collar bones... anywhere you wish to draw attention to'. 'The pressed palettes are almost too gorgeous to use - the beautiful embossing looks wonderfully 'art deco' - and the finely-milled, pearlescent formula lends 'light' without shimmer, to enhance your favourite features in an instant. Starlight - a white gold that's perfect for fair skin. So Hollywood - a true gold that's perfect for medium skin tones. 'The easy-to-use, long-lasting answer to eyebrow perfection, whatever the natural state of your arches. This tinted, creamy formula is waterproof, smudgeproof and ideal for creating defined, natural-looking brows that won't run down your face. The gel-mousse consistency glides on seamlessly and adheres to each individual hair'. 'With 360 degrees of edgeless perfection and an innovative open cell structure, that retains moisture to minimise makeup absorption, Beautyblender Pro Black permits optimal dispersion of base, concealer, blush or bronzer, to grant skin a beautiful, soft focus finish'. 'A beautiful, buttery pressed powder, this illuminator is so finely milled it's almost creamy - perfect for granting a dazzling, lit-from-within skin-finish'. 'This facial spray acts like a vitamin shot bringing an instant burst of radiance to the complexion. It is a quick way to refresh your skin and wake yourself up at that 4pm lull in the work day'. 'Supermud Clearing Treatment purges pores of blackhead causing grime, whilst resurfacing skin with a specialist blend of alpha-hydroxy acids. Suitable for use as a full mask or targeted on-the-spot treatment, this quells unwelcome rebellions; unifying skin tone and stimulating the synthesis of elastin and collagen'. 'An 'instant' facial, the combination of minerals, clays, essential oils and extracts work to brighten, tone and tighten in as little as fifteen minutes. A perfect pre-date skin pick-me-up, it gently exfoliates to loosen dulling dead cells whilst hydrating, conditioning and encouraging the production of collagen'. 'This treatment turns from mud-to-oil, to eliminate makeup and dirt with a pore-purifying medly of four muds and four oils that leaves your skin looking like new. This luxurious creamy clay formula removes all traces of weekly build up and dirt - ideal for those with congested complexions, who want a detoxing yet nourishing twice-a-week deep-cleansing treatment'. 'This physical exfoliator leaves skin feeling peachy smooth and soft - polishing to perfection, without upsetting your skin's sensibilities. Packed with resurfacing ruby crystals to eliminate surface dirt, dead cells and debris, this reveals a refined and radiant skin surface within seconds'. 'Huda Beauty's bestselling style, Samantha #7 are an essential addition to you false eyelash collection. They suit every eye shape and grant daytime drama without looking overtly 'faux'. They're also suitable for layering, for those who like maximum impact'. 'Ultra-long and voluminous, Huda Beauty's Scarlett #8 are the perfect accompaniment to daring eye make up looks - granting enviable length and curl thanks to lashes of varying length and thickness'. 'With easy-to-follow instructions and beautifully buttery, blendable powders, Kevyn Aucoin's The Contour Book: The Art of Sculpting & Defining is a stunning addition to your make up wardrobe'. 'The brand's exquisite range of hard-working, multi-tasking products allows you to achieve a flawless professional-looking finish whether you're a make up expert or a beauty beginner'. 'With a potent blend of high-tech natural ingredients including a broad range of vitamins and essential skin nutrients, this is the original gel cleanser of its ilk; totally unique, it helps to strengthen and revitalise skin whilst eliminating every last speck of residual everyday grime'. 'Astonishingly good value, this Morphe Brushes palette contains an array of wearable shades for achieving a spectrum of subtle to smouldering make up effects. The sleek, slimline palette is a favourite of professional make up artists, while the buttery powders blend together beautifully to achieve a seamless, photo-ready finish'. All till 30th June 2016.